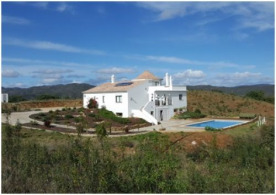 Beautiful villa, built in 2015, in a rural setting in Portugal`s eastern Algarve. 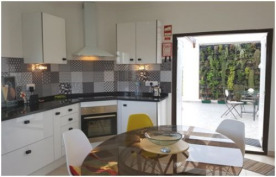 The villa is located in the tiny hamlet of Eiras Altas, near the town of Sta Catarina da fonte do Bispo. 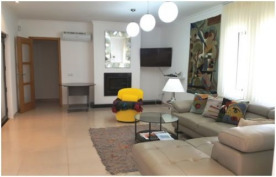 The historic city of Tavira, with its shops, restaurants and other amenities, is about a 15 minute drive away, and Faro airport is about 30 minutes` drive away. There is a golf court and beaches nearby. 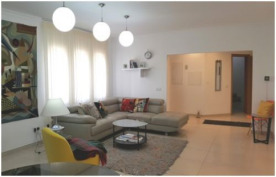 -	4 luxury en- suit double bedrooms and 2 studios, one of which located within a circular tower with spectacular panoramic views of the surrounding hills, countryside and ocean, and private outdoor terrace. 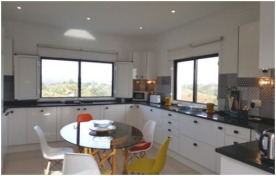 -	Large kitchen and dining area with windows looking out onto surrounding hills and countryside.